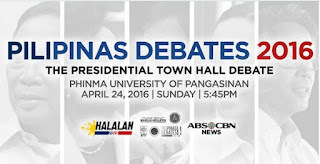 All five presidential bets have committed to attend the final presidential debate which will be held at the Phinma- University of the Philippines in Dagupan City, Pangasinan on Sunday, April 24. That means even Senator Miriam Defensor-Santiago, who was noticeably absent and sorely missed during the second presidential debate, will be in attendance. Media partners for the last debate are ABS-CBN and Manila Bulletin. Inside the venue, only 30 media members will be allowed, broken down into 5 national, 5 foreign, and 20 local media representatives. The third and last in the series of presidential debates will be aired at 6 P.M. on ABS-CBN, ANC, DZMM TeleRadyo, ABS-CBN News Channel on cable, and DZMM 630 on AM radio. For people who are always online, livestreaming of the debate is available at news.abs-cbn.com, mb.com.ph, and iwantv.com.ph. 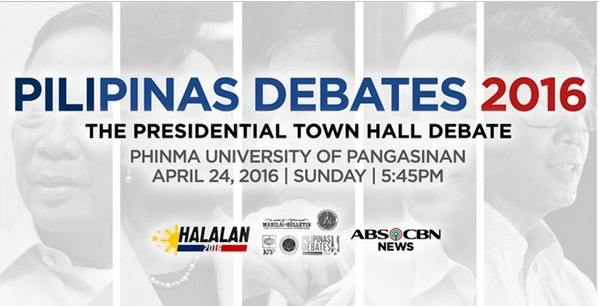 The debate will follow a town hall format, which will allow ordinary folks to ask questions on problems and issues confronting most Filipinos. There will also be a Face-Off segment where a candidate can grill another candidate regarding his or her ability to lead. Expect some fireworks again from the presidential candidates namely Vice President Jejomar Binay, Mayor Rodrigo Duterte, former Department of the Interior and Local Government Secretary Mar Roxas, Senators Grace Poe and Miriam Defensor-Santiago. COMELEC Chairman Andres Bautista said, "This is the final opportunity for voters to know and gauge the candidates. On the other hand, this is also a good chance for candidates to explain their platforms and solutions to the country’s problems." Likewise, Malacañang is also encouraging the public to watch the debate on Sunday so they would know more about the presidential bets and their opinions on various issues confronting the nation.